Moving into a high-rise building is a unique experience. Living in a high-rise is a lot of fun and offers a ton of amenities (not to mention great views), but the move-in process can be a bit tricky if you aren’t prepared for it. Here are some tips on moving into a high-rise building to make sure the process goes smoothly. Unless you’re moving from one apartment into another, it’s likely you’ll need to do some decluttering and downsizing to fit into your new high-rise residence. The space tends to be limited in order to offer the many other amenities and low-maintenance that high-rise living has to offer. Also, keep in mind that everything has to be moved into the building and up several floors to get to your apartment. The less you have, the easier moving day will be. To make sure everything will fit into your apartment, it’s a good idea to plan out the space ahead of time. Your building manager can provide you with a floorplan. You don’t have to plan out every detail but at least figure out where the larger pieces of furniture will go by measuring them and then placing them in the floor plan to see how they will fit before you waste time lugging them up the elevator or stairs. Don’t forget to measure doorways, too, especially ones that curve so you can make sure your furniture will actually fit through the thresholds, including the elevator and hallways outside of your apartment. Most high-rise buildings have rules and regulations regarding moving. This includes things like what time of day you’re allowed to move, which elevators you’re allowed to use (you may be required to use a freight elevator or reserve one of the main elevators ahead of time), and other factors that can have a big impact on moving day. Find them out ahead of time so there are no surprises or conflicts. It’s good practice to let your building’s management know what day you plan to move in before that day arrives. This way, they can be prepared for the extra foot traffic and alert other residents if necessary, since the process can be disruptive. You also need to make sure it isn’t falling on the same day as someone else’s move since the space is limited and you all have to go through the same doors and elevators. Most high-rise buildings require their residents to use professional movers that are insured to protect the building from damages and other mishaps. Some buildings won’t even allow DIY moves, only professional movers. When you are choosing movers, be sure to ask if they are insured and obtain proof to show your building manager. 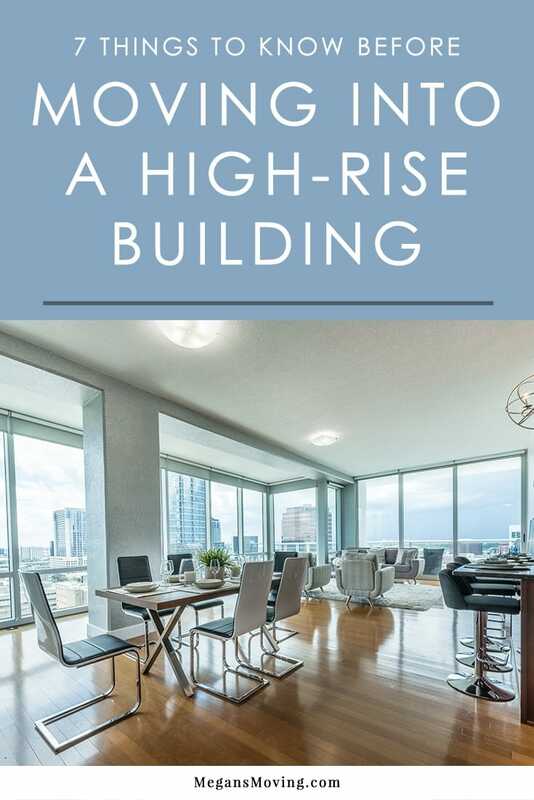 Unlike when you move into a house or other apartment buildings, high-rise buildings require you to bring your items through common interior areas before making it to your personal unit. Take extra safety precautions to pad doorways and other edges so that no damages are made to the building or your belongings as they are being moved in. At Megan’s Moving, we always take these extra safety measures regardless of the type of home or building. Parking spots can be limited at high-rise buildings, especially for large trucks. Before your moving day, talk to your building manager and secure parking spaces for the moving truck(s) and any other vehicles you’ll be using on moving day that will provide easy access into the building.